In what year did the New Testament Church begin? 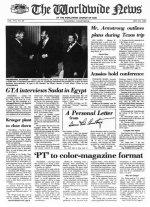 Mr. Armstrong outlines plans during Texas trip - Aussies hold conference - GTA interviews Sadat in Egypt - 'PT' to color-magazine format - Radio interview with Mr. Rader broadcast before appearance - College trustee dies - The Worldwide Radio Church of God? - Champs chosen in YOU tournaments - When GTA into Egypt went... - Local church news wrap-up - The Official Grapevine - HWA visit - Aussies hold conference.